Lovely time had in Paris!!! Anyway, after my morning at the Louvre, I returned to my hotel (where my room was now ready), exhausted, and intending to take a short nap, before returning to the Louvre for a few hours, since my ticket was good for the whole day. Despite the mustiness of the room, and the decidedly unsupportive pillows, I crashed hard and didn’t make it out of the hotel until it was time to meet my old friend Catherine for dinner. But before I go on to dinner, I would like to ask this hotel related question: where is it socially acceptable for hotel staff to ask to enter a hotel room to empty the entire mini-bar, when the occupant of the room peers out the edge of the door wearing nothing but a towel??? Answer: apparently the Hotel Normandy. At least the male manager (assistant manager maybe, some level of management I’d guess) stayed out of the room while the appropriately sheepish-looking girl came in and out, emptying my fridge while I looked on with a towel on my head and another around my body. Other than this little incident, though, I will say the staff was very kind and helpful. I guess I would stay there again, as the location was fantastic, but it certainly wasn’t a luxurious hotel experience. After resting and relaxing for the afternoon, I went to meet Catherine for dinner. France was playing Mexico in the World Cup that evening, so every restaurant we passed was notably empty. Catherine selected a lovely little restaurant called Mystery Cuisine (http://www.restovisio.com/restaurant/mystery-cuisine-130.htm – check out the video tour of this little restaurant – it’s in French, but even if you don’t understand what he’s saying, you’ll get an idea of the feel of the place). It’s a french-vietnamese fusion restaurant with really quite lovely combinations of tastes! We had the whole place to ourselves, so the chef waited on us, and we had the “discovery menu” along with a “discovery” wine tasting flight. 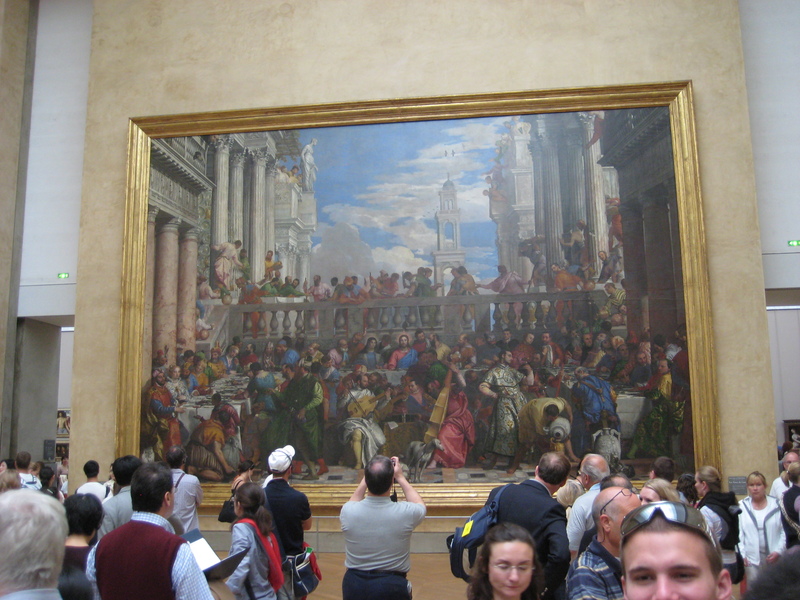 It really was a wonderful meal – I’d recommend it to any of my “foodie” friends who visit Paris!! Once back at the hotel, I felt the effects of jet-lag and got a second wind, so I decided to return to the Louvre to walk around the grounds and see the pyramid lit up at night. I was surprised to discover a throng of people all in white, as apparently the square had been taken over by a flash-mob of people all in white. This is known as the pique-nique en blanc (picnic in white), and of course I was wearing all black! The scene was fun though, and I was able to see people dancing, listening to live music and drinking champagne in the surrounding area. They seemed to be having such a great time! It was like the world’s classiest, un-sports-related tailgate. It was a little surreal to walk through – no one paid me any mind though, and they just kept having fun as I meandered through the square and down the Seine river a ways before returning to my hotel. One good night’s sleep later, and I had another full day in Paris before I was due at the airport to head to Africa. I opted to sleep in and relax for the morning, before heading out for a little shopping and on to the tour boats. For an hour, I was entertained by a tourism student’s narration of the sites that we passed by, the Pont Alexandre; the Louvre (gorgeous from the outside! ); a bunch of other bridges – some scenic, some not so much; Cathedral Notre-Dame de Paris; Hotel Dieu; and, of course, the Tour Eiffel. After the tour was over, I decided to walk towards the Arc de Triomphe, strolling through the Jardins de Tuileries along the way. 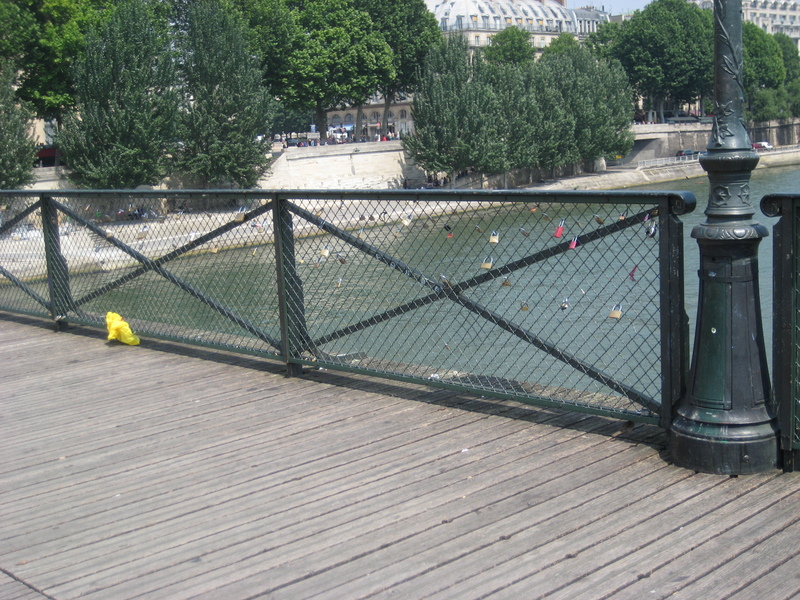 My stroll took me over the Pont des Artes, towards the Louvre, where I discovered an interesting phenomenon: the bridge was covered in all kinds of locks. 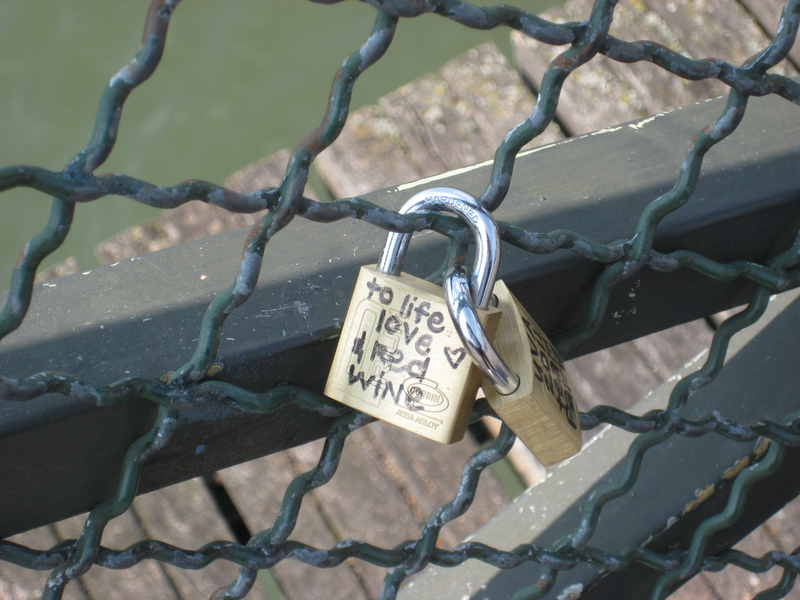 Apparently, people commemorate their love sometimes by writing on or engraving a lock, and affixing it to this bridge. (For an article about this, check out this link: http://french-news-online.com/wordpress/?p=681). I was fascinated by this idea and took a little time to examine a few of the locks and snapped a few photos of the bridge and a couple of the locks that I enjoyed. After a little more strolling along and a ham & cheese crepe that I shared with some birds in the park, it was time to head off to the airport once again and resume my journey to Africa! Djibouti, here I come!!! Until my next post, take care all! 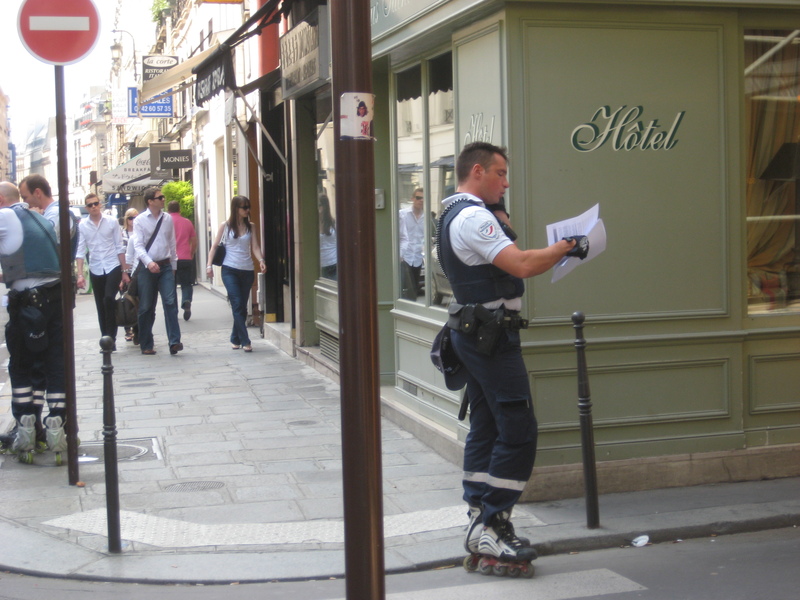 PS – I leave you with this picture of Parisian cops on rollerblades….. just because the concept tickled me. 🙂 Be well!